Jim Hickey’s interesting story last spring about baseball, starting with games on the Arctic ice by Vineyard whalers, and moving naturally along to games on Waban Park in Oak Bluffs in the early 1900s, brought exciting memories in the Barnes family. Living on the park’s western end in the summer months since 1943, we all were well aware that our late beloved father, grandfather and patriarch, Clarence A. (Clare) Barnes Sr. played on the Oak Bluffs baseball team for many summers. We well knew of his diamond exploits on the Island, as well as for Yale University in 1904 and 1905, preceding his adventurous and successful life dedicated to law and politics in Massachusetts as well as on the national level. Through his long life he also fathered nine children, in a sense his own personal team. He loved playing baseball in Waban Park. The fact that he bought our house with the long porch looking out over the park is probably no coincidence. For more than a quarter of a century he could be seen walking across the park, quite near where the old baseball diamond was, for his daily swim, calmly side-stroking along with a pleasant smile. The Gazette’s postcard picture of the circa 1910 game on the park is a charming depiction of those days, with the women spectators in long, white dresses, with large tin lizzies behind them. 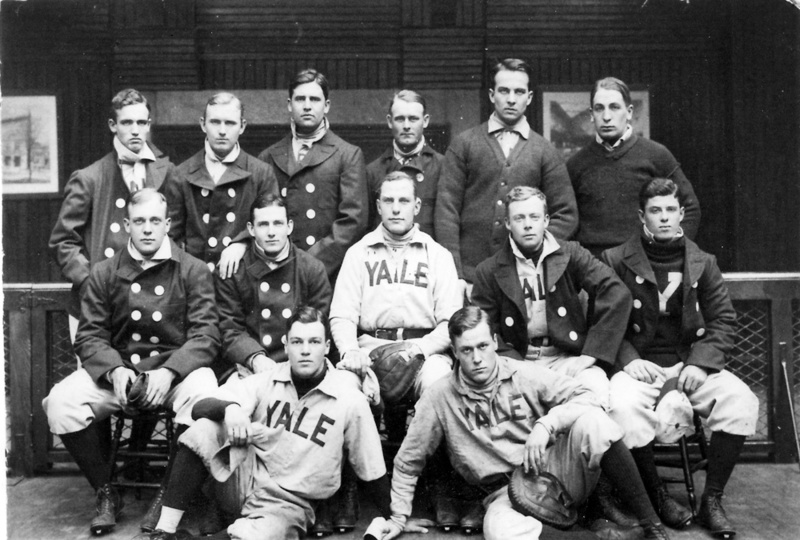 But the most eye-catching part of that postcard reproduction for us was the batter, who is clearly wearing a Yale jersey. My brother Peter McCall Barnes sent me a copy of the story thinking I would find it interesting. My sister Margo Barnes Goodwin and I have a feeling that the batter is our father. He is batting lefty and casually holding the bat at his side in a typically nonchalant and natural stance. Just a few Yale men played for the Oak Bluffs team in that era. He was a center fielder and a leading batter with an average well over .300. Of course, the batter in the postcard might have been his good friend and Yale 1904 teammate, Harold Metcalf of East Chop, who played a stellar second base on Waban Park and in college. Or even more remotely possible, it could be the famous Yale man, Walter Camp of All-American football (and baseball) lore, who played mostly for Cottage City and was also mentioned in the April Gazette article. Camp’s baseball days in his prime would have been several years earlier than the 1910 postcard, since he was in the class of 1880. That was our grandfather’s (William Barnes) class. At that class’s 25th reunion, our father (the class baby, or first born of the class) hit a line drive home run to right center to help beat Harvard 7 to 2. Forty years later, when Dad was about to become attorney general for Massachusetts, Boston Globe publisher William O. Taylor asked my then 11-year-old sister Rosalee, now Mrs. David McCullough, if her father had ever told her about the home run he hit against Harvard. “That’s all he ever talks about!” she quickly replied. I am sure William Taylor, a Harvard man, chuckled at this youthful spontaneity. The eclectic Oak Bluffs summer team is shown on the front porch of a cottage with Dad, seated third from right, attired in his Yale sweater. His brother, our uncle Bill, sports his freshman numerals. And his cousin, Donald McKay, a pitcher, is sitting on the grass. Harold Metcalf’s Yale “Y” is partially obscured. Like Walter Camp before him, he also played football. These four are the only ones whom we can identify. It would be interesting if any Gazette readers, with all the enthusiasm for baseball on the Island, might recognize other players. They may have played for Michigan, Maine or Massachusetts, possibly Princeton or Kenyon. Dad’s political friend, albeit a Democrat, and longtime summer resident, Francis X. Hurley may be in the photo as well. Dad had his first interview in Boston for a legal position in Samuel Elder’s law firm. Attorney Elder may have been a Yale graduate as family legend informs us. He questioned Dad at length and after perusing his academic credentials, he told Dad he couldn’t find a place for him. As Dad left, disappointed of course, he heard Elder’s booming voice exclaim, “Say, aren’t you that Barnes fellow who hit the home run against Harvard?” Dad quickly replied, “Yes, sir!” Elder then said, “Well, well, what do you know, you’re hired!” So Dad’s first legal job calls for a doff of the cap to baseball, and hence my name, too, Samuel Elder Barnes.